Now Playing | Sofia Makes Ice Cream Cone Cupcakes 192. Sofia Valastro makes cupcakes with a twist! Watch how she makes tie dye cupcakes in ice cream cones. Wedding cakes, baking cakes, cake shop, recipes, decorating, ideas and designs. Sofia Makes Ice Cream Cone Cupcakes I Cake Boss. Related Videos. ... Coloring Easter Eggs with Sofia the First and Hello Kitty Stickers| B2cutecupcakes. View other videos for “Cake Boss ” Video Player ... Sofia Valastro makes cupcakes with a twist! 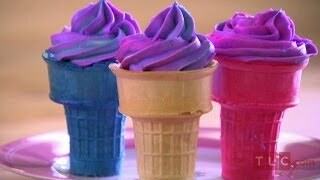 Watch how she makes tie dye cupcakes in ice cream cones.